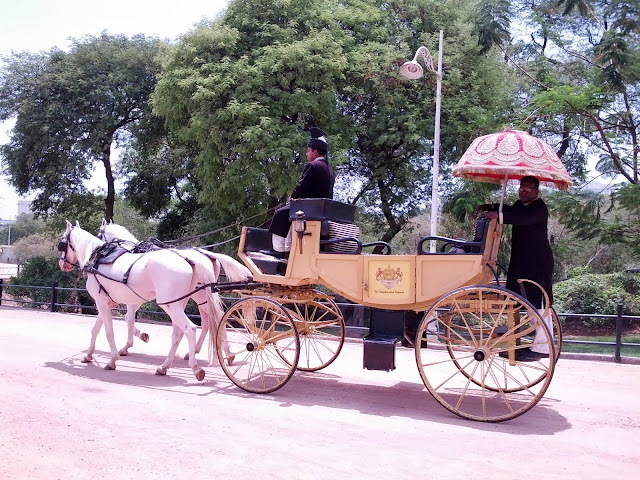 Falaknuma Palace images still dance in my mind from the time I took my team out for a posh six course lunch in Hyderabad India. You can visit Falaknuma Palace for dinner or high tea, but we found Falaknuma Palace's lunch service to be amazing and a bit more affordable. What better way to take a midday break than a gourmet menu and a walk around the historic grounds of this top Hyderabad point of interest taking plenty of photos along the way. 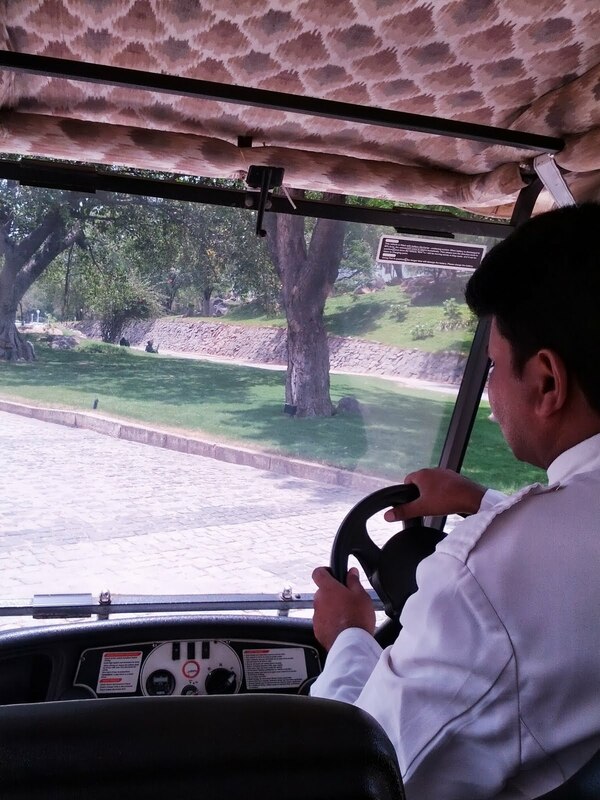 Our cab pulled onto the grounds after the ~1 hour ride from HITEC City. We were delighted to see this horse drawn carriage roll pass. Alas, it wasn't for us and I was told later that it costs 12000 rupees (>$200) to take this mode of transportation from the gatehouse to the palace. We piled into the free golf cart that drove us to the entrance. It had the added benefit of moving fast enough to generate a cooling breeze to break the oppressive heat (>100 °F). We were impressed by the sun bleached exterior of the palace as we rolled past. The golf cart dropped us off and we looked back at a side building done in the Mughal style. A number of antique cannons pointed outward from the terrace toward the city below. Classic European-style sculptures anchored the edges of the terrace. We looked down from the hill and could see the center of Hyderabad, including Charminar, in the smoggy distance. The beautiful greens of the trees and grass popped against the heat induced smog. We walked onto the front porch which was cooled by the marble floors. Giant columns of dark wood stood sentinel. A series of intricate double doors stood out against a geometric-patterned tiled floor. We turned back to take one last look at the terrace before ducking inside. There was a small museum inside the palace decked out in historical furnishings and featuring large dramatic painted portraits of the Nizams (historic Muslim rulers of Hyderabad) who called Falaknuma home. Photos weren't allowed inside. We soon emerged onto an interior courtyard and took a walk around since we were early for our lunch reservation. An impressive cobbled path lined the interior. Beautiful trees with orange flowers added some vibrant color to the scene. We emerged onto a Victorian-styled terrace near the restaurant. An antique stained-glass dome topped the structure. We could see the chaos of Hyderabad sprawled out below. I even caught a glimpse of some children playing a pick-up game of cricket. Small fountains provided a welcome playground for the resident pigeons. The Falaknuma Palace is now run as a hotel (part of the Taj chain). The rooms ran alongside the interior courtyard with rattan furniture offering a shaded place for guests to sit outside. Rumor has it that rooms here cost upwards of $500 dollars per night! We caught a glimpse of another terrace off to the side of the central courtyard and made our way to it. We emerged onto a lush garden shaded with palms. We spotted an antique bathtub that was now home to lily pads and other greenery. The palms themselves were heavily laden with dates. The garden continued along the outside of the Palace. We stopped for a few minutes to rest in the heat on this shaded wrought iron bench. The tangle of leaves above offered welcome cover from the sun. Finally it was time for our lunch reservation and we were ushered into the dining room. I had a small backpack with me which the host immediately took and put on its own personal pedestal next to the table. The dining room was tastefully decorated with small chandeliers and high ceilings. We were the first to arrive for lunch that day and business seemed a bit slow (another couple arrived just as we were finishing up). The food itself was amazing. The meal started with poppadoms and a variety of chutneys. Mangoes were in season during our visit so, of course, I had to try a mango cocktail. We each had our own colorful fruity drink to kick off the meal. The first course was a pan fried corn cake. Next up was a trio of vegetarian appetizers including chargrilled baby corn, paneer cheese, and another pan-fried cake. Inside we found an exquisite tamarind sorbet to cleanse our palates. The main courses were served in shiny brass pots alongside a heaping basket of naan. I opted for the vegetarian choices (part of my strategy when in India to avoid food poisoning due to a sensitive western stomach). I tried a dollop each of a delicious veg curry, paneer makhni, black lentils, and a creamy spinach dish. A refreshing cold towel arrived on a pearlescent platter. Dessert consisted of five mini-dishes including a creamy yogurt, spiced apples, apricots stuffed with a sweet cheese, and a beetroot pudding. I managed to devour all of the desserts except for a smidge of the beetroot. It was just too unusual of a flavor for dessert. After a very filling and satisfying lunch, we retraced our steps through the courtyard. We took one last look out across the city drawing a sightline over one of the cannons. The golf cart bumped its way down the cobbled driveway back to the entrance gate. 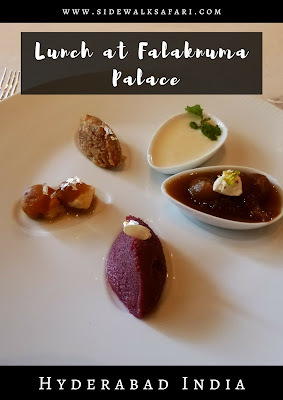 Falaknuma Palace is definitely worth a splurge if you find yourself in Hyderabad. Conjure up Falaknuma Palace images in Hyderabad India. Explore the grounds of the historic home of the Nizams of Hyderabad. 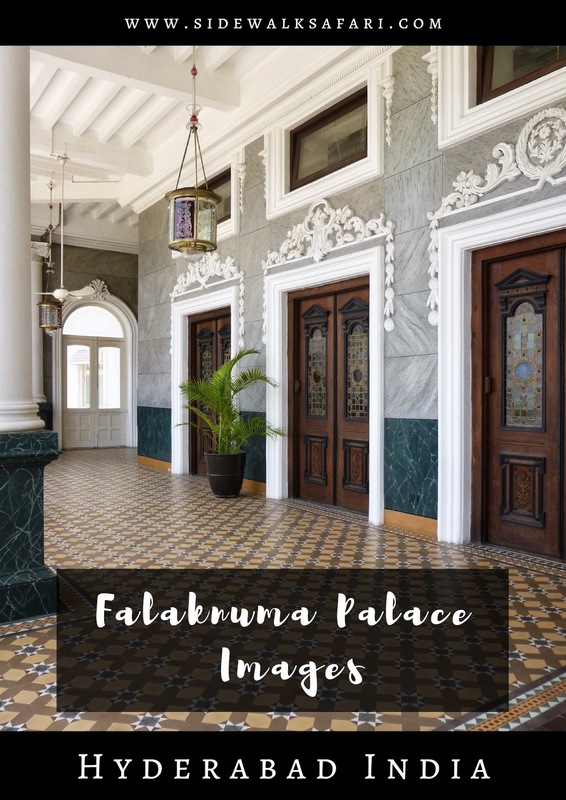 Capture Falaknuma Palace photos before enjoying a gourmet lunch.